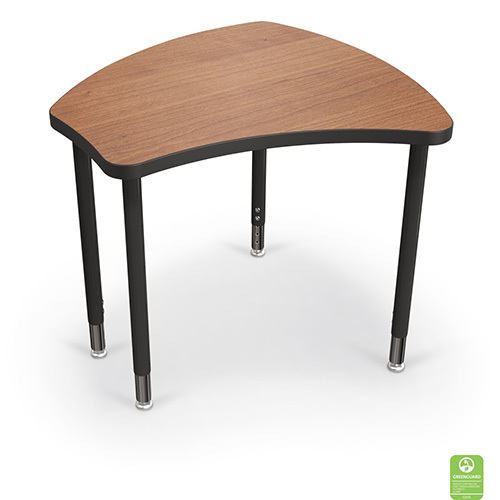 Shapes Desk brings simplicity and functionality in a customizable package made to any classroom or study setting by offering quick and easy assembly, numerous group configurations, height adjustability and custom laminates. Join the Shapes Desk together in a multitude of waus to fit your classroom needs. The highly versatile table's ergonomic shape provides ultimate flexibility and workspace comfort and allows for easy left or right hand seating. The Shapes Desk is available in two sizes for space saving ergonomics. Height adjustability (22" to 32" in 1" increments) allows ADA compliance with three ADA compliant sitting positions with the larger table. 1-1/4" top with solid tubular steel leg available in black or platinum with chrome insert and an optional set of two casters adds easy mobility without impairing maneuverability. There is also an optional wire bookbox (4"H x 15"W x 13-1/2"D) in black or chrome to match the chosen desk.